Our Latin America Week keynote speaker is Jakeline Romero Epiayu, from La Guajira, Colombia. Jakeline is a member of local organisation Fuerza de Mujeres Wayúu (Wayúu Women’s Force) which works to visibilise the violations of human and ethnic rights in La Guajira, and to strengthen the rights of women and indigenous communities in the region. The organisation also works on denouncement of the negative consequences of mining and energy mega projects in the region, such as the Cerrejón coal mine. 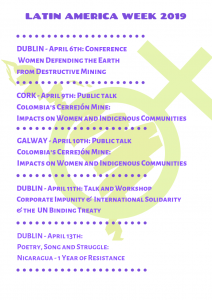 For Latin America Week 2019, LASC are delighted to present this half-day conference – Women Defending the Earth from Destructive Mining: Examples from Latin America and Ireland. This event is free but we ask participants to register through Eventbrite. Latin America has some of the world’s dirtiest and most dangerous extractive industries, such as mining, logging, and mega-dams. These extractive industries often impact the most on rural and indigenous communities, with severe negative consequences on local livelihoods, community cohesion and the environment. People who stand up against these powerful interests face persecution and sometimes murder – Latin America is the most dangerous region in the world to be an environmental and/or human rights defender. There is also gendered dimension to the impacts of extractivism, with women more affected than men, as they are so often responsible for care-giving in families and communities. Women also face additional threats as land and environmental defenders such as sexual violence. Many of these extractive projects are driven by multinational corporations based in the Global North, with much of the material extracted also destined for consumption by Global North populations. Our keynote speaker, Jakeline Romero Epiayu, will be representing communities affected by the Cerrejón coal mine, Latin America’s largest open-cast coal mine, in La Guajira, Colombia. All of the coal from this mine is exported, the vast majority to European countries, including Ireland – where the ESB purchases this coal for energy production. Ireland is also home to the mine’s global sales company. LASC is part of a coalition of organisations raising awareness about this issue. However even Global North countries like Ireland are becoming more affected by the global thirst for resources, caused by consumerism and unbridled corporate greed. Ireland has seen a threat of fracking – now successfully banned – and there is now a threat of gold mining in the Sperrins mountains in Co. Tyrone. However, the impacts of extractive projects are different between Global South and North, as is people’s capacity to resist these projects, as well as the consequences people face for defending their environment and livelihoods. Jakeline Romero Epiayu is a Wayúu indigenous woman and human rights defender from the department of La Guajira, in the Northeast of Colombia. Jakeline has held the role of governer of the Zahino indigneous reserve/protected area and she forms part of local organisation Sütsuin Jieyuu Wayúu (Fuerza de Mujeres Wayúu in Spanish Wayúu Women’s Force in English), which was founded in 2006 through an alliance between communities, rural settlements, and social processes with the objective of visibilising the violations of human and ethnic rights of communities in La Guajira. The organization has also led processes of denouncement of the negative consequences of mining and energy mega projects in the region, such as the Cerrejón mine. Because of its work, this organization has suffered systemic threats. In 2017, Fuerza de Mujeres Wayúu received Colombia’s National Prize for the Defense of Human Rights. Blanca holds an MA in Development Studies from the former Development Studies Centre in Kimmage, Dublin, as well as an MA on Social Anthropology from the Research Institute of Social Anthropology in San Cristobal de las Casas, Mexico. She has worked in NGOs both in Ireland and Central America for almost twenty years, spending most of her time in Guatemala, where she was Trocaire’s Country Director. She is currently Trócaire´s global Resource Rights Advisor. Fidelma O’Kane is a mother of four, retired lecturer and a member of Save Our Sperrins community group. SoS was formed to organise against a proposed goldmine which would use cyanide to extract gold from the Sperrin mountains. SoS and other community groups have set up a protest camp (Greencastle People’s Office), permanently peopled for over a year now. Fidelma is often invited by communities across the island of Ireland to speak about her community’s fight to protect their home. Lynda Sullivan campaigns on extractivism for Friends of the Earth NI and is a LASC committee member. She recently spent 5 years living with communities in Cajamarca, Peru and involved herself in their struggle to defend their land from what would have been the largest gold mine in Latin America. She previously worked in the human rights sector in Ireland, north and south and is a freelance writer. Join us for a talk with Jakeline Romero Epiayu, an indigenous Wayúu woman and human rights defender from La Guajira, in the Northeast of Colombia. The region is home to the Cerrejón mine – Latin America’s largest open-cast coal mine, covering 690 square kilometers. It is owned by three of the largest mining companies in the world, and is causing untold environmental and social damages to the region and its people – 35 indigenous communities have been displaced by the mine. Jakeline has held the role governer of the Zahino indigneous reserve/protected area and she forms part of local organisation Sütsuin Jieyuu Wayúu (Fuerza de Mujeres Wayúu in Spanish Wayúu Women’s Force in English), which was founded in 2006 through an alliance between communities, rural settlements, and social processes with the objective of visibilising the violations of human and ethnic rights of communities in La Guajira. The organization has also led processes of denouncement of the negative consequences of mining and energy mega projects in the region, such as the Cerrejón mine. Because of its work, this organization has suffered systemic threats. In 2017, Fuerza de Mujeres Wayúu received Colombia’s National Prize for the Defense of Human Rights. 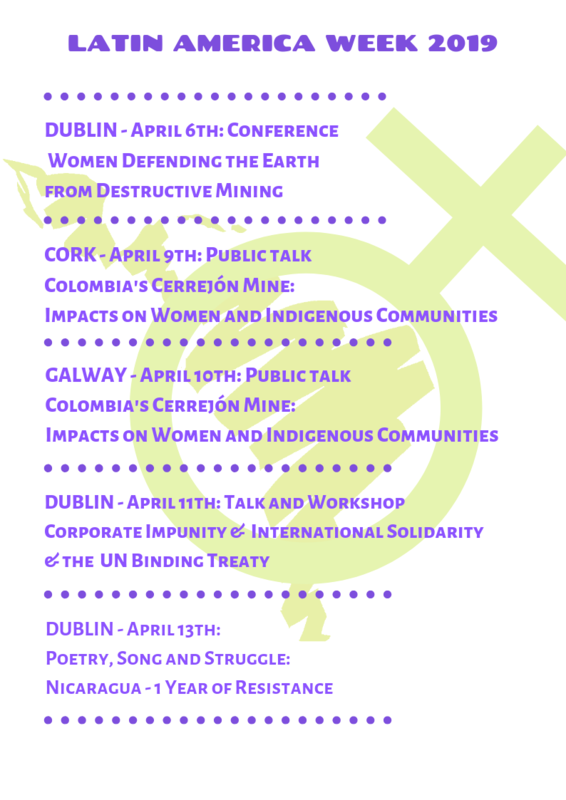 The Coordinator of the Latin America Solidarity Centre, Sian Cowman, will also speak to us about the direct connections between Ireland and the mining taking place in La Guajira. All of the coal from the Cerrejón mine is exported, the vast majority to European countries, including Ireland – where the ESB purchases this coal for energy production. Ireland is also home to the mine’s global sales company. LASC is part of a coalition of organisations raising awareness about this issue. You can find the Facebook page for the Cork event here, and the Galway event here. This event is free but we ask participants to register through Eventbrite. In the context of Latin America Week 2019, we invite you to an evening of discussion and debate on corporate impunity and international solidarity. Find out more about the efforts underway at the UN for a binding treaty on multinational corporations and human rights – and why even if successful it cannot be relied upon to hold back damaging corporate power. The evening will include voices from grassroots struggles in Latin America as well as organisations working on global campaigns trying to challenge and dismantle corporate power. There will also be a participative discussion on corporate power in the Irish context, and the limits, constraints and possibilities of current forms of solidarity work. What are we learning about international solidarity in the current political climate in Europe? What are the limitations of focusing on international policy? What new forms of more direct solidarity are emerging? What can we learn from them? The Democracy Center together with the Global Campaign to Dismantle Corporate Power – led by the Transnational Institute (TNI) in Holland – are leading this event. Join us for the last event of Latin America Week, for an afternoon of poetry, song and performance to celebrate and mark a year of resistance to the Ortega-Murillo government in Nicaragua, and to reflect on the repression that has left so many dead, or afraid to return to their country. We will be joined by poets, artists and musicians from Ireland and Nicaragua, and will hear the stories of Nicaraguans who have been personally affected by the government crackdown. You can find the Facebook event here and register to attend through Eventbrite here.